Some claim that the Holy Spirit is an impersonal power. But viewing him in that way falls far short of what the New Testament teaches, undermining a full understanding of one of the most exciting and encouraging dimensions of our relationship with God. In teaching about the Holy Spirit, the New Testament uses analogies related to both power and personhood. But why the mixture? If the doctrine of the Trinity is so important, why didn’t the New Testament authors spell it out more clearly? It’s important to remember that the Bible was written within a particular cultural setting where some things were understood without detailed explanation. It’s the same today. If I mention “Monday morning quarterbacking” to Americans, most know what I mean without elaboration. But people unfamiliar with American football culture would not understand. As we read what the Bible says about the Holy Spirit, we need to ask, are we expecting it to answer questions that were not questions in its original cultural setting? Would the original audience have assumed without further explanation that the Holy Spirit was personal and acted as a powerful agent? Scripture shows us that the answer is yes. There are many places in Scripture where the Holy Spirit is referred to in personal terms. In John 16:14, Jesus refers to the Spirit using a personal (rather than a neuter) pronoun, saying “He will glorify me.” In Acts 15:28, the apostles spoke of the Spirit in personal terms when they said “It seemed good to the Holy Spirit and to us.” The characteristics of a person are assumed by the biblical authors when they spoke of the Holy Spirit acting as do human persons: teaching, comforting, guiding, giving, calling and sending. They spoke of the Spirit as being resisted (Acts 7:51), argued with and personally replied to (10:14-20), grieved (Ephesians 4:30) and lied to (Acts 5:3-9). They also spoke of the Spirit distributing gifts according to his own will (1 Corinthians 12:11). The early church recognized that “Holy Spirit” was used throughout Scripture as a proper name, just as are “Father” and “Son.” Jesus indicates that all three are personal names when he directs his disciples to baptize in “the name of the Father and of the Son and of the Holy Spirit” (Matthew 28:19). This command hearkens back to Jesus’ own baptism where the Father, the Son and the Spirit were each personally present (Matthew 3:13-17). Jesus distinguished the Spirit from himself in a personal sense when he said, “I tell you the truth; it is expedient for you that I go away for if I go not away, the Comforter [Paraclete] will not come unto you; but if I depart, I will send him unto you” (John 16:7 KJV). Jesus regarded the Holy Spirit not as an effect (comfort) but as a person who brings comfort (the Comforter). In saying that he would send the Holy Spirit, Jesus distinguished the Spirit from himself and the Father in a personal sense: “But the Counselor [Paraclete], the Holy Spirit, whom the Father will send in my name, he will teach you all things and will bring to your remembrance all that I have said to you” (John 14:26 RSV). ”When the Counselor [Paraclete] comes, whom I shall send to you from the Father, the Spirit of truth who proceeds from the Father, he will bear witness to me” (John 15:26 RSV). Because the name Paraclete is unfamiliar to us (my spell-check keeps asking if I mean “parakeet”! ), English Bibles translate it as Counselor, Helper, Advocate or Comforter. But these translations fall short in conveying the name’s full meaning. Those who spoke Koine Greek understood Jesus’ meaning—they recognized that Jesus was speaking in personal terms when referring to “the Paraclete,” just as he was speaking in personal terms when referring to “the Son” and to “the Father.” Though these personal names were revolutionary, they were not ambiguous. In the ancient world, paracletos often was used in a legal sense—like our words advocate, attorney or lawyer (though likening the Spirit to a lawyer might not go down so well today!). Paracletos also was used in a military sense. Greek soldiers went into battle in pairs, standing together as they fought off the enemy. The Greeks called this trusted soldier and friend a paraclete. So when the first disciples heard Jesus refer to the Spirit as the Paraclete and speak of him otherwise in personal terms (as in Acts 1:5, 8), Jesus’ meaning would have been apparent to them without further explanation. A definite doctrine of the Trinity was found to arise out of a faithful exegetical interpretation of the New Testament and out of the evangelical experience and liturgical life of the Church from the very beginning. It made explicit what was already implicit in the fundamental deposit of faith. 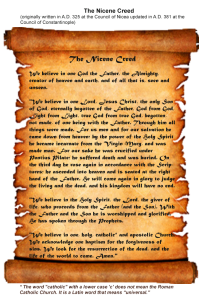 It was with the formulation of the homoousion [meaning “of one being”—the term used in the Nicene Creed] clarifying and expressing the essential connection of the Son to the Father upon which the very Gospel rested, and with the application of the homoousion to the Holy Spirit to express his oneness in being with the Godhead of the Father, that the theological structure of the Trinitarian understanding of the Godhead unfolded and established itself firmly within the mind of the Church (The Trinitarian Faith, p. 199, emphasis added). 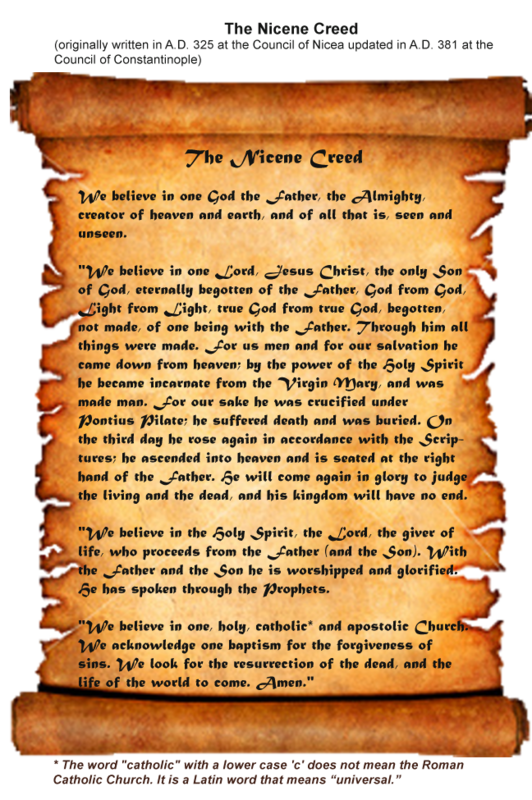 Though the Nicene Creed made explicit the personhood of the Father, the Son and the Spirit, some Western thinkers (particularly since the Enlightenment) have explained God’s nature in impersonal, mechanistic and creaturely ways, including saying that the Holy Spirit is not God, but an impersonal power that emanates from God. But impersonal explanations of God’s nature always fall short. Why? Because God is not a creature, nor is he a mechanism. His true nature as a tri-personal, relational God is known only by revelation, from Jesus, recorded in Scripture. There the Holy Spirit is revealed as the Paraclete—a divine Person who is personal just as are the Father and the Son. Grounded in this stunning revelation, we may think, speak, worship and act with assurance, knowing that the Holy Spirit is God just as the Father is God and the Son is God. One God; three persons: blessed Trinity! For an eye-opening study on the Bible’s cultural context, see the book, Misreading Scripture with Western Eyes by Richards and O’Brien.